This driver insists he can drive safely while using a mobile phone. He then immediately crashes as the cyclist he’s arguing with is recording the incident. 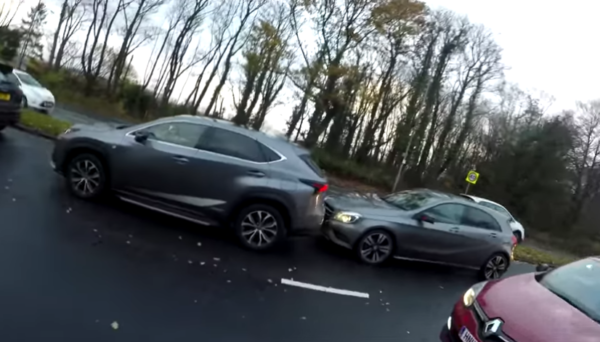 A driver has been recorded via helmet cam crashing his car while arguing with a cyclist over road safety. In the video below, the cyclist accuses the driver of using his mobile phone behind the wheel. And after the duo get into an argument, the driver rear ends the car in front of his in traffic. Media reports in Scotland, where the incident occurred, stated the footage was recorded last month, though it is only now emerging. It occurred during morning rush hour just outside Glasgow. Cyclist David Brennan spoke to The Scotsman newspaper, offering his version of accounts. “I was surprised to see this driver on his mobile phone, especially as he was looking down at it whilst driving,” he said. “I called over to encourage him to stop using it, as it is not safe to drive whilst look at a phone. Brennan said when he caught up with the driver the verbal exchange continued. The driver complained he was cycling at three miles per hour. “He then proceeded to accelerate forward as the traffic ahead of him stopped and he crashed into the car in front,” he added. Brennan confirmed the driver he was arguing with was not using a phone at the time of the crash.